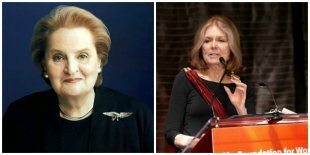 Two powerful backers of Hillary Clinton attracted headlines—and outrage—this weekend when they uttered sweeping statements under the banner of “feminism,” calling on young women to back the former Secretary of State’s presidential bid. In the days following, many have scrutinized the hawkish track record of Albright, who also served as the U.S. ambassador to the United Nations. In just one example, Albright told “60 Minutes” in 1996 that half a million children who died as a result of U.S. sanctions against Iraq were “worth” the price. “Albright has a hell of a lot of nerve telling young women who may be very concerned about Clinton’s support for virtually all U.S. wars of recent years that they should vote for her because she’s a woman,” Phyllis Bennis, senior fellow at the Institute for Policy Studies, told AlterNet.